We’d love your help. 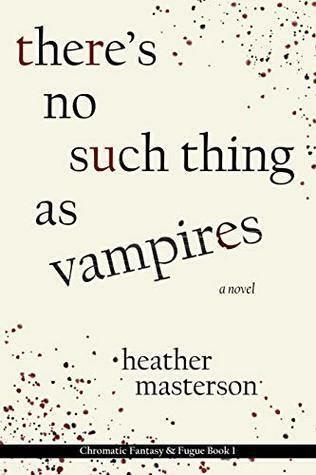 Let us know what’s wrong with this preview of There's No Such Thing as Vampires by Heather Masterson. When Joe Kinderman gave in to his fear of being hurt, he lost Casey to another man. When her car was found abandoned and bloody on the side of the road, he thought that she was gone forever. A camping trip leads to a startling discovery in the woods, and Joe gets the one thing he thought wasn’t possible: a second chance. Unexpectedly immersed in a world where all the rules When Joe Kinderman gave in to his fear of being hurt, he lost Casey to another man. When her car was found abandoned and bloody on the side of the road, he thought that she was gone forever. A camping trip leads to a startling discovery in the woods, and Joe gets the one thing he thought wasn’t possible: a second chance. Unexpectedly immersed in a world where all the rules have changed, Joe has to decide just how far he’ll go to keep the woman of his dreams. To ask other readers questions about There's No Such Thing as Vampires, please sign up. That quote from the author sums up my experience with There’s No Such Thing As Vampires. The book is a raucous, twist-filled adventure-mystery that kept me guessing at every turn; every time I thought I had it figured out, a line of subtle foreshadowing paid off and changed the direction entirely. I couldn’t put it down, and when I had to, I couldn’t stop turning it over in my mind; it got it’s hooks into me and wouldn’t let go. I was lucky enough to receive an advanced reader copy, but I liked it enough that I preordered a production copy, and will likely be giving copies as gifts. This story starts out heading one direction, and seems perhaps a bit slow, but then it takes a delightful turn, and I just couldn't put it down. The characters and story are engaging and delightful. Well worth the read, and I am looking forward to more stories from this world and this author. I had an advanced reader copy of this book and thoroughly enjoyed it. I was hooked from the beginning and cannot believe the turns the story took. The author’s conversational tone really engages the reader. Well written, highly recommend! This book caught me pretty quick and then it went to the point I didn't want to do my chores and business because id have to stop reading! It hooked me. If you like psychological thrillers that aren't horror, then you'll love this. Some may call it horror if they're squeamish but its really not. This book was a trip, and not necessarily in a good way. I guess the realm of fantasy-psychological thrillers is a niche genre that doesn't really suit my tastes. I commend the author for her experimental style and for daring to write a plot that takes hard lefts and rights in unexpected directions, but I had a hard time keeping up with what was going on, and the strange mixing of mythologies, realities, and fantasy tropes was a mix of cool (in a "break all the rules" way) and frustrating (in th This book was a trip, and not necessarily in a good way. I guess the realm of fantasy-psychological thrillers is a niche genre that doesn't really suit my tastes. I commend the author for her experimental style and for daring to write a plot that takes hard lefts and rights in unexpected directions, but I had a hard time keeping up with what was going on, and the strange mixing of mythologies, realities, and fantasy tropes was a mix of cool (in a "break all the rules" way) and frustrating (in the "I don't know what the rules are because you've broken all of them" kind of way). As a writer myself, I admire the author's ability to write something original and mind-bending and wild. As a reader, I found the book disorienting and exhausting to read, especially since I rarely have the luxury to read in long, uninterrupted stretches, so the jumps in time within the plot were exceptionally hard to follow when coupled with the jumps in time in my real life when I found moments to come back to this book.